Amidst constant weight from the international sports governing bodies, Sri Lanka’s Ministry of Sports assured that it would expedite the process of holding Annual General Meetings or elections of 18 local sports governing bodies. According to a paid advertisement of the Ministry of Sports published in local daily newspapers the deadline set for the AGMs or elections is the final week of July. 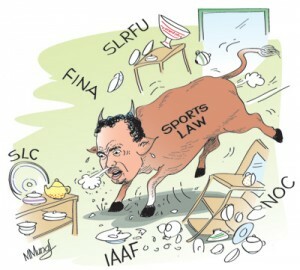 The Ministry of Sports, however, came under severe warning from five international sports bodies after the appointment of Navin Dissanayake as its overseeing Minister with confusion drawing from the newly legislated Sports Law by his predecessor Mahindananda Aluthgamage. One of the debated clause by the international sports bodies was the amended tenure of the elected officials and the non-ability of seeking another term. Among those who pressured Sri Lanka were the International Olympic Committee (IOC), the International Cricket Council (ICC), FIFA (the world body for football), International Rugby Board (IRB) and the latest additions being FINA (the international body for swimming and diving) and the International Association of Athletic Federations (IAAF). The Ministry of Sports first got the word of warning when Minister Dissanayake intervened to appoint an Interim Committee after dissolving the elected officials of Sri Lanka Cricket (SLC), when it could not meet the deadline set for elections. Warnings came persistently when the Ministry of Sports intervened on the election of Sri Lanka Rugby Football Union (SLRFU), which took the matter to the spotlight of the IOC. According to experts in the sports field the amended Sports Law to replace the Sports Act of 1973 has brought good changes to the local sports administration but certain clause were severely condemned by the international sports bodies, citing they indicate influence and involvement of politics into sport. With the past three months being hectic to Minister Dissanayake and his team the Ministry of Sports is on the verge of amending the Sports Law, which according to K.D.S Ruwanchandra, its Director General, would take at least another month to complete. “We are in the process of drafting the amended Sports Law, to suit the constitutions of local and international sports governing bodies. Already we have had many discussions and will have to meet frequently before completing the draft,” Ruwanchandra told the Sunday Times. Last month Minister Dissanayake postponed the elections of SLRFU which was set to be held on May 14, at a function held a day prior to felicitate the winning Sri Lanka team of ARFU Asian5Nation Division I Championship in Colombo. In April a letter addressed to the incumbent president of SLRFU, Asanga Seneviratne, copied to the Ministry of Sports and the National Olympic Committee of Sri Lanka (NOC) from Ross Mitchell, the General Manager of ARFU pointed out certain aspects of a letter sent to the Minister Dissanayake and copied to Thomas Bach, the President of International Olympic Council (IOC), all International Sports Federations concerned including the IRB and ARFU and the NOC. On April 7, Minister Dissanayake received a package from Jérôme Poivey, the Head of Institutional Relations and Governance of the NOC Relations Department from the IOC Headquarters in Lausanne, Switzerland. The package included a joint letter along with all relevant attachments and copies of previous IOC letters sent to the former Minister of Sports Mahindananda Aluthgamage dated March 12, 2013; September 6, 2013; November 15, 2013; December 6, 2013; February 28, 2014 and November 24, 2014, thus, depicting the lethargy from the side of the Ministry of Sports. The issue has now gone beyond the boundaries with similar demands being made by the ICC, IAAF and FINA, which stated that it would send one its representatives to observe the development and report to the international body. The Football Federation of Sri Lanka (FFSL) however held a passive election after nearly two decades sans controversy. Late this week the IAAF became the fourth international sports body to put pressure on Sri Lanka demanding amendments to the controversial sports guideline urgently. The IAAF reminded that Sri Lanka’s sports law should fall in line with the Olympic Charter and with the delay only pushes them to refuse to recognize the newly elected officials of the Athletics Association of Sri Lanka (AASL) headed by former sprinter Sugath Thilakaratna. According to reports officials of IAAF and AASL have met in Wuhan, China where the Asian Athletics Championship is being held, to discuss in this regard. This week Majid Waseem, a member of the FINA Masters Committee and the Associate Secretary of the Asian Amateur Swimming Federation will come down to meet the officials of Sri Lanka Athletic Sports Union (SLASU), the NOC and the Ministry of Sports before compiling a report for the FINA Bureau on the impending issue caused by the crisis. A media statement issued by SLASU stated that Waseem would meet Minster Dissanayake to clarify the situation regarding the interfering clauses of the Sports Law and its regulations affecting its national federation, before deciding on further course of action. “FINA in the absence of a reply to its original letter of 9th April 2015, issued SLASU a directive and informed the Minister of Tourism and Sports on 11th May 2015 to postpone the elections until the Ministry revises the Sports Law and/or its regulations within the IOC imposed time period of two months. FINA also warned that non-adherence to its directive will cause the FINA Executive to take further measures,” it stated. The IRB, ARFU, IAAF and FINA have warned its respective local representatives of consequences and the likeliness of being sidelined from upcoming international events if the controversial Sports Law exists without being changed. With pressure mounting on the Ministry of Sports, it had set dates for elections of 18 local sports bodies. The Volleyball, Karate Do and Badminton Associations will have their elections on July 27 while the next day has been allocated for Rifle Shooting, Hockey, Rugby Football, Golf and Tennis governing bodies. On July 29 elections of Bridge, Carrom, Amateur Boxing, Handball, Rowing and Softball Cricket will be held. The elections of Differently-abled Sports, Motor Cycle, Throwball and Traditional Karate will be held on July 30 according to the newspaper advertisement of the Ministry of Sports. “There will not be any need to hold re-elections for the ones that are already completed. We have experts in our panel and we are looking at coming out with a comprehensive draft that will not affect any local sports body in the future. It will be based on public interest and the sport not on any individuals. Elections of certain bodies were put off due to that reason and the ones that are yet to be done could be held after the amended Sports Law is released,” Ruwanchandra added.